Neosilurus means new catfish; dragging my mind back to when I first saw a representative of this family of catfish, it seemed really quite appropriate to me at that time. It had been a long time since I'd seen a new catfish in the sense of one belonging to a family I had yet to see a single representative from. If I remember correctly, the first one I saw was Neosilurus glencoensis. Glen Coe is a beautiful part of Scotland which someone else clearly agreed with when they named two different places after it in Australia (there's also a Glencoe in New Zealand, South Africa, Canada and seven US states!) That this lovely Scottish glen then became attached to a species of catfish appealed; I have often lamented that Scottish waters do not teem with catfish. It was only a few months later that I saw another, Tandanus catfish and also saw the marine coral catfish (Plotosus) for the first time too. So, it was 1999 and I'd just seen all these fish for sale. These “new catfish” were unusual-looking fish that reminded me somewhat of a cross between a North American bull head (Ictalurus) and a stinging catfish (Heteropneusteus sp.). My overall impression was that the head was that of the American catfish, and the tail being that of the Asian. However odd that might sound, the overall effect was a very cool fish. That said, at that point in time I had a fish room squeezed into the smallest room in my second floor Edinburgh tenement flat, so, sadly, fishes that grew much bigger than six inches / fifteen cm were not allowed in. 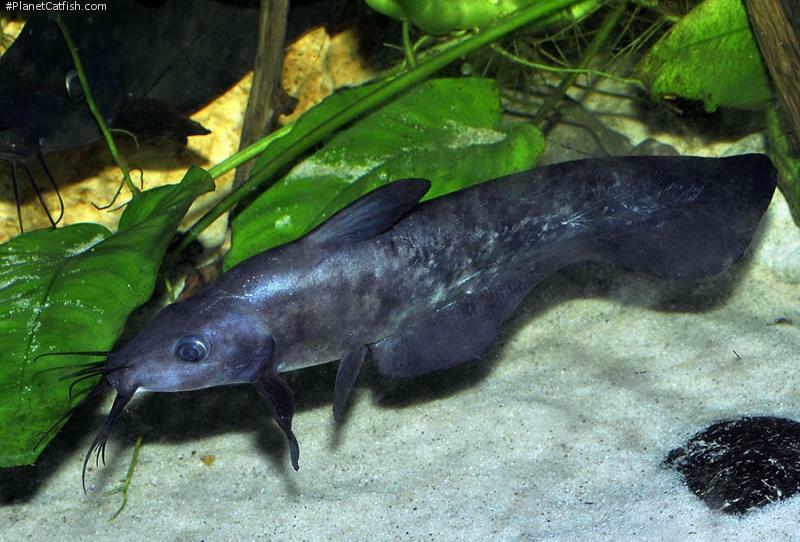 Eel tailed catfish, or Plotosids, to use the scientific name, actually appear in many general hobby books that contain a section on marine fishes. Here is singularly found the coral catfish, Plotosus lineatus. Maybe it's just been a statistical anomaly but as I said above, I'd never seen this fish either. This may also be due to the fact that when I walk around a fish store, I can spend two minutes in the marine section and two hours in the freshwater. Other Plotosids are uncommonly found in hobby books, wider research yields that around 50% of the thirty two species contained in this family of catfish lived in Australian or New Guinean freshwaters. The remainder are found spread across the Indo West Pacific in brackish or marine environments. Many of the freshwater species appear to live out their lives in a very limited area. Tandanus for example hatch, grow, mate and ultimately die without seeing much more than 5 kilometres of their home river. This puts populations at great risk of environmental degradation from localised pollution or from over fishing. I didn't see another Neosilurus again until 2006. In the intervening time, the fish didn't wander far from my memory and I had the opportunity to do quite a lot of research on it. I'd also moved out of the city and had a lot more space for my second fish room which was now in a room the size of a smaller bedroom. So when I saw Neosilurus ater for sale I knew that they maxed out at 47cm total length but were much more commonly found to grow to around 25cm / a foot in the wild. This was about as big as I could manage, but I reckoned the fish would take a couple of years to reach this size and had a suitable tank ready. I took a few weeks to think about it, but I ordered three and had them shipped into Scotland. I read that they eat molluscs, crustaceans, worms and insects; this wouldn't be a problem and anyway I've found catfishes that eat molluscs and crustaceans to consistently and readily adapt to aquarium food — at worst I would be looking after a fish that would only eat frozen foods. They also seemed relatively adaptable to water being reported from still but favouring moving water and I was fascinated by the facts of their distribution. They occur in population pockets along Australia's Northern coast, each separated by hundreds of kilometres, on a few Australian islands and also across the island-studded Torres Strait in southern New Guinea. The scale of this distribution is interesting: west they can be found in the Fitzroy River, Western Australia, there's a number of the Northern Territory freshwaters near the coast in which they occur, but nothing south of the Roper River. They are found in rivers in the northernmost tip of Queensland's Cape York Peninsula which, as an aside, is the northernmost point on the Australian continent. From the tip, it is about 140 km to New Guinea where the species is also widely found. The east (and indeed southernmost) point of this species' disjointed distribution is in the Burdekin river, Queensland; that's approximately 3000 km from where we started. So, what are they like to keep? One thing I did read in a number of places was that these fish were loners. This is behaviour that I have yet to observe and suspect it applies to adult fish. Being moderately as opposed to well fed, they appear to grow about 7-8cm a year and so this behaviour is probably still at least a year off. At present they are, in terms of characters apparent to the fishkeeper, one of the most endearing catfishes I've kept. Some of this is down to their mostly languid cruising of open areas of the aquarium with their bullhead faces. Actually, it's in the face that this species is distinguished from other congeners in that it has a longer profile, it's more “snouty” as Corydoras keepers are want to say. They do not dig in sand as one might expect from this morphology, but rather cruise surfaces with their barbels just shy of touching, looking for morsels of food. The catfish are active and out around the front of the tank all day long, the tank is not brightly lit and this appears to help, but the catfish show little inclination to retreat to hiding places even when I approach the tank. Feeding is a piece of cake, not that I've literally tried that, but what I wish to say is that they eat sinking tablets of various types and really pig out on frozen foods. I have a suspicion that they will eat snails as most of my tanks have had snails at on point or another but none in the tank with the N. ater. It should be noted however there are several other catfish in there that may also be the molluscivore — it's just a hunch of mine. As I write, plans for fish room mark III are on the drawing board. This will include a large show tank which is viewed from a larger living room on the other side of the fish room wall. Of all the catfish I keep, the one I think most about keeping in this new show tank are the black cats. It is, I think, testament to their outgoing nature, graceful swimming style and cosmetic appeal that makes them an ideal fish for a show tank. This is one catfish of which you won't hear a “and what do you have in this tank” enquiry. Type Locality Inawi, Papua, New Guinea. Size 450mm or 17.7" SL. Find near, nearer or same sized spp. Identification Distinguished from congeners by its relatively elongate snout. Gray to blackish overall (sometimes mottled), paler on the belly. In some populations, both sexes develop a bright golden-orange hue on the sides during breeding. Distribution Northern Australia and central-southern New Guinea. Feeding Feeds on molluscs, insects and prawns in the wild. Carnivorous but not a fussy eater in the aquarium. Will not eat small fishes. Furniture Found in rivers and smaller streams, usually where currents are relatively swift. Thus, plenty of swimming space is required. Hiding spaces in the form of PVC pipes and / or driftwood are necessary. Compatibility A peaceful, solitary species. Can be safely kept with smaller fishes. Breeding In northern Australia, breeding takes place during December in shallow areas with a good water flow and a sand / gravel substrate. Eggs of about 2 mm in diameter are produced. Allen, GR, H Midgley & M Allen, 2002. Field guide to the freshwater fishes of Australia. Western Australian Museum, Perth. 394 pp. There are 12 registered keepers, view all "my cats" data. There are 3 records of this fish being seen, view them all.